作者: The AsiaN Editor on 21 January , 2019. The Jogye Order, South Korea’s largest Buddhist sect, is planning to launch a templestay program at Shingye Temple on Mount Geumgang as part of their effort to open “a new chapter in inter-Korean Buddhist exchanges” amid their reformation movement, Ven. Wonhaeng said Wednesday. “We are going to discuss details of the templestay program in North Korea with the parties concerned,” chief administrator of the Jogye Order said in a press conference. A templestay is a cultural experience program aiming to help people understand Korean Buddhism better. 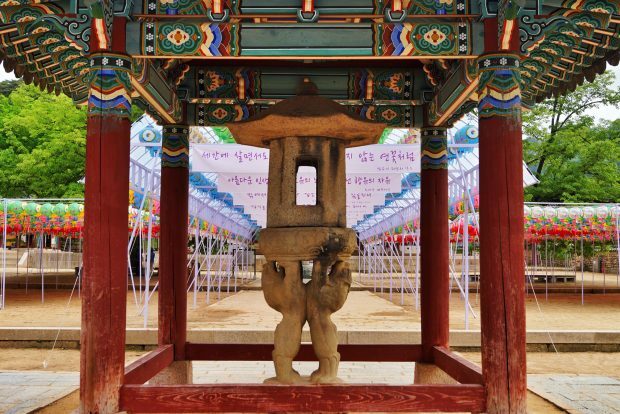 Several South Korean Buddhist temples have their own such programs, allowing participants to take a peek into the life of Buddhist practitioners and learn Buddhist culture and history. Singye Temple is one of the four major Buddhist temples on Mount Geumgang. The temple, destroyed during the 1950-53Korean War, was restored in 2007 under a North-South joint project facilitated by the first inter-Korean summit in 2000. Ven. Wonhaeng added that the Jogye Order will prepare for operational measures such as dispatching monks to the North and building accommodation facilities before opening working-level discussions with the North. The sect said they are planning to hold a joint New Year ceremony with the Choson Buddhist Federation on Mount Geumgang next month. “We will discuss inter-Korean exchange projects including the templestay program during the ceremony. For this year’s Buddha’s birthday, we will also seek ways to hold celebratory lantern lighting ceremony in streets around temples located Pyongyang,” Ven. Wonhaeng said. According to the chief monk, the sect’s annual plan also includes holding a joint inter-Korean festival by inviting North Korean Buddhist officials to the South on the day of Buddha’s birth. “It is difficult to discuss expansion of the templestay program to other temples in North Korea now due to financial issues. A more urgent problem is the afforestation of North Korean temples and we plan to obtain and send 600,000 trees to North.” On November, the new chief was elected on his pledges to “reform the Jogye Order.” Former sect Chief Ven. Seoljeong, stepped down amid corruption scandals, triggering a major division in the sect’s followers. Initially, four candidates were supposed to run in the election, including Ven. Hyechong, Jungwoo, Ilmyeon and Wonhaeng, however, all except Wonhaeng suddenly dropped out of the race simultaneously, claiming election fraud. “I feel a grave responsibility rather than the joy of being elected,” Ven. Wonhaeng said in his ceremonial speech.